Dr. Mandt’s past research includes comets, the atmospheres of Titan, Pluto, Triton and Mars as well as the surface of Mars and the Moon. Past experience includes work on three National Aeronautics and Space Administration/European Space Agency (NASA/ESA) missions. During the November 30 colloquium, Dr. Mandt mostly focused on observations that were made during the Rosetta Mission, a NASA/ESA mission she collaborated on that was designed to orbit and land on a comet. Dr. Mandt spoke on how the environment of a comet changes over time, solar wind interaction and more. She also spoke on how she is passionate about mentoring and public outreach. She also guessed that many students in attendance were on similar career paths as her. “I hope you remember this and in your future focus on mentoring and outreach to develop the next generation and share the work that you do,” she said. 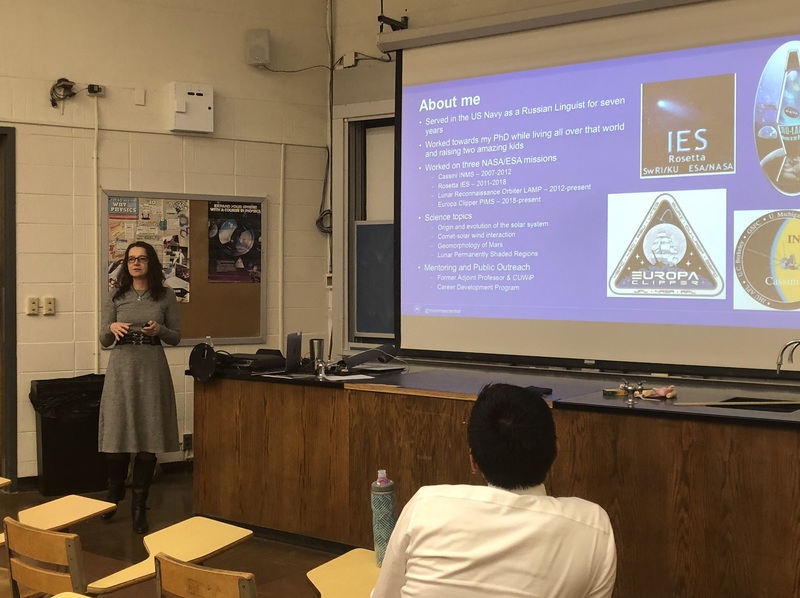 Dr. Kathleen Mandt, Planetary Scientist, introducing herself to the audience before presenting “Plasma Boundaries in the Inner Comae of Comets" at Auburn University.